Long hours and late nights are the order of the day here at the speed shop this time of year. If you have noticed a "longer than normal" spacing between posts, that is the reason. Besides a couple of Panhead engines in for complete rebuilds, I have five sets of Knuckle heads here for valve jobs, with two of them getting big intake valves and porting. Oh, and don't forget the Big Twin Flathead top end. Then of course there are the normal dozen+ sets of modern heads in various stages of being ported. And then there is another biggie: an S&S 113 being turned into 126 cubic inch for drag race use only. All but the porting on the modern heads tends to be quite "time intensive." I had better stop there. I am beginning to scare myself. The drag race motor, despite being based on a fairly modern design, is the kind of project that I can sink my teeth into. For one thing, its not the type of engine I build very often. Add to that, its somewhat challenging from a porting prospective. The standard S&S SuperStock heads, while providing more flow than a stock Evo head, have some serious limitations in their "as manufactured" state. Hopefully, with some heli-arc and grinding bench time, I will be able to remedy that somewhat. 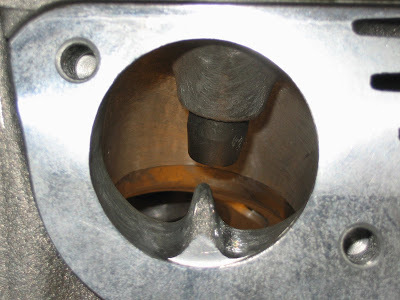 Stock S&S intake port sports a very low floor along with an "interesting" vane protruding from it. My guess is that the design was influenced by the need to fit an air cleaner below wide fatbob tanks. The first step in the process of attempting to make these into "racing" heads is to remove the guides and seats, followed by a generous build up of the floor in order to provide a good short side shape. note: The welding in the picture above shows evidence of the approximately 15 years since I have had access to a tig welder. Now that one resides in my shop, I expect the welds to start looking more professional with a little more on the job training. 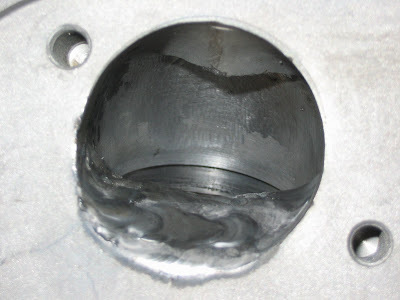 The chambers were also treated to some added material so that when done, 30 degree domed pistons will provide enough compression ratio for the motor to be run of E98 racing fuel (E98 is a commercially available mixture of 98% ethanol which is carefully controlled to maintain consistency). I will try to give updates on this project as it proceeds. This post would have been more timely at the begining of this week, but Happy New Year (better late than never)! As we begin a new year, one thing is sure ...we are another year closer to the fulfillment of this prophesy that we find in Revelation 21. And perhaps it is because of promises such as this one for a new heaven and a new earth, that we look forward with anticipation to each new year. In the passage above, God said "Behold, I make all things new." Obviously we have good reason to believe this. The same one who sits upon the throne and promises this new heaven and new earth and a new Jerusalem coming down out of heaven, is the same one who created it all so long ago. If we go back to the book of Genesis, we see the story of how God spoke the world into existence. God said, let there be light: and there was light. By his word, God separated the dry land from the sea. He called trees and grass and animals into existence, and it was all NEW! And it was GOOD! ...that is until we messed it up. And when I say we, I am including all of us in along with Adam, because though he was technically the one to get thrown out of the paradise that was the garden of Eden, if he hadn't done it, you or I certainly would have. Have you ever thought that? Adam only had one law given to him to keep - why couldn't he have just kept it? The ruin this world is in, is all Adam's fault, right? Yes, ...but my answer to that is, which one of God's laws have you never broken? And that, in effect was the Old Covenant, or Testament as we most often call it. If Adam had obeyed God, he and his would have lived, but Adam ate of the forbidden tree and death entered into the world. All was not lost though! No sooner had we broken the old covenant, than God promised that a new covenant would replace it. We get the smallest glimpse of that promise in Genesis 3:15 when God tells the serpent that he "will put enmity between thee and the woman, and between thy seed and her seed; it shall bruise thy head, and thou shalt bruise his heel." Further on in Genesis we see a little more of that picture of the New Covenant in the story of Abraham offering his son Isaac as a sacrifice. In fact throughout the Old Testament, more and more of the picture that is the New Covenant, or New Testament are revealed. But when we get to the Gospels, finally all the pieces of that picture which is the New Covenant, are revealed. The picture becomes clear and vivid. The New Covenant is that Jesus Christ lived the sinless life that was required of us, and not only that, but he died paying the penalty for our sins that was required of us. And he sealed that New Covenant with his own blood. Entry into this New Covenant begins with a New Birth. As the Bible tells us in John 3:3 Jesus answered and said unto him, "Verily, verily, I say unto thee, Except a man be born again, he cannot see the kingdom of God." When you are newly born, obviously everything is new to you. It is the same with this spiritual rebirth. 2 Corinthians 5:17 tells us: "Therefore if any man be in Christ, he is a new creature: old things are passed away; behold, all things are become new." Does that sound familiar? In the text we began with in Revelation, God said "Behold, I make all things new." This new creature that God says we will become once we are born again, leads to something else new. How we act. Romans 6:4 "Therefore we are buried with him by baptism into death: that like as Christ was raised up from the dead by the glory of the Father, even so we also should walk in newness of life." Here Paul compares the way our conscious decision to be obedient to Christ causes us to conduct our lives differently with being raised from the dead! If we experience a New Birth, resulting in our being a New Creature, then walking in this newness of life should show up as some sort of recognizable change. We all experience the New Year, every year. But not all experience the New Birth, or becoming a New Creature and walking in Newness of Life. And for those who never have, I must go back to our original text to the verse that follows it. The first seven verses of Revelation 21 are filled with all kinds of wonderful promises such as a new heaven and new earth, God dwelling with us and wiping away all tears from our eyes, and making all things new. But verse 8 says this: "But the fearful, and unbelieving, and the abominable, and murderers, and whoremongers, and sorcerers, and idolaters, and all liars, shall have their part in the lake which burneth with fire and brimstone: which is the second death." If you have never entered into the New Covenant by way of the New Birth, then you are one of those mentioned in that verse, and I would focus on one of those in particular: the unbelieving! But it is never to late this side of the grave. Won't you come to God in repentance, putting your faith in the fact that Jesus Christ died for your sins?